Today you may need to take an honest look at some of your own imperfections and projections as a means toward healing something that has caused you pain. The Devil is an archetypal figure that can take on many forms. He represents all of our own personal “shadow material,” i.e., all of the more sinister human attributes, such as anger, fear, jealousy, rage, manipulation, etc. You could unwittingly conjure up this archetype via the Sun / Pluto square today. This aspect correlates astrologically to the Devil archetype through bringing power struggles and ruthlessness to the forefront. Feeling betrayed, used, bullied, deceived or unfairly judged: these are all possibilities within the realm of the Devil. The sense of futility, unfairness and feeling powerless are common experiences. 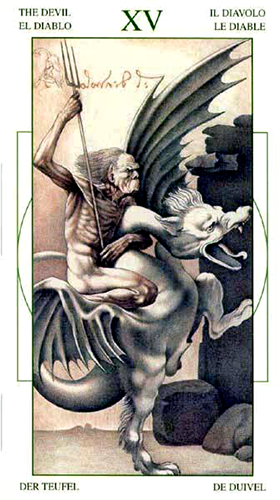 If you look at the imagery in this card, you can see that the Devil is wrestling with his own fantastic beast. He also clearly has the upper-hand. But how hard would it be for the beast to wrench himself away, knock the Devil to the ground and fly off and out of reach? As this is likely to be true for any of the emotions you’re dealing with today, your goal should be to take back your power and liberate yourself from your own personal Devil by sending him back to his own domain. The card used for today’s Tarot Scopes comes from the Da Vinci Tarot, a Lo Scarabeo deck by Mark McElroy, published by Llewellyn.